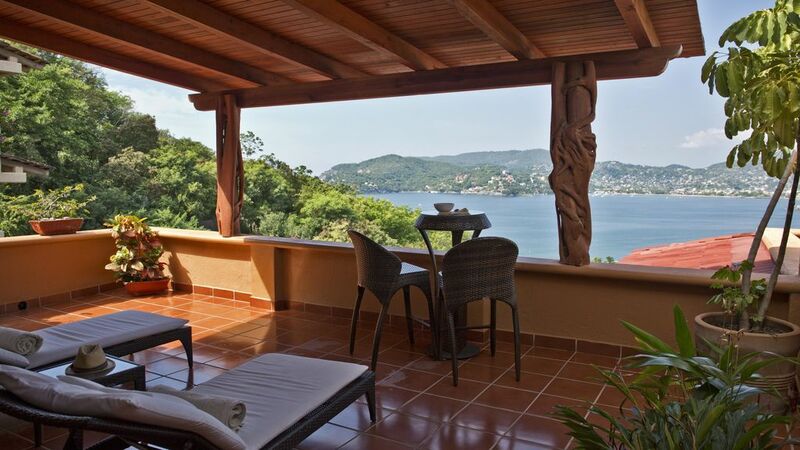 Perché sur une pente verdoyante surplombant Playa La Ropa, notre belle location de vacances Zihuatanejo offre une retraite tranquille au cœur de la Riviera mexicaine. Nous avons tout ce dont vous pourriez rêver, dont 300 mètres carrés d'espace de luxe, deux terrasses privées, et une piscine de style resort vous serez pratiquement avoir à vous. Tout ce qui manque que vous! Ce condo spacieux et calme peut accueillir six personnes avec salle d'épargner, et de ses commodités rivaliser avec celle d'un hôtel haut de gamme. La suite chambre des maîtres paisible dispose d'un lit king-size et une grande terrasse où vous pourrez bronzer tout en profitant de la vue sur la baie de Zihuatanejo. Les brises de l'océan des deux terrasses sont divins! La deuxième chambre, également avec un lit king-size, offre une vue imprenable sur les montagnes environnantes. La troisième chambre dispose d'un grand lit et un lit double-size. Chaque chambre possède sa propre salle de bains, ventilateur de plafond, et A / C.
Que vous préparer vos propres repas ou profiter de nos services de chef traditionnel, vous trouverez tout ce dont vous avez besoin dans notre cuisine entièrement équipée. Rassemblez dans la salle à manger intérieure pour un déjeuner informel, ou dîner en plein air sur le pont que vous buvez dans la vue de l'océan Pacifique. Ensuite, bronzer près de la piscine de l'hôtel de style que vous sirotez votre margarita de sel cerclées et profiter de la brise de l'océan de lumière. Lorsque vous êtes prêt pour un changement de décor, il est un court, de quatre minutes à pied de Playa La Ropa, où vous pouvez nager, bateau, tuba et plongée. Las Gatas, une plage isolée vous ne pouvez atteindre en bateau ou à pied, est à dix minutes à pied de la location. Il ya de nombreux restaurants à distance de marche ainsi, y compris de nombreux favoris trou-dans-le-mur et restaurants haut de gamme avec des chefs bien connus. Vous pouvez également conduire cinq minutes à Ixtapa, une petite ville avec deux parcours de golf de classe mondiale, un marché traditionnel de l'artisanat, et une variété de restaurants et de discothèques. Cette superbe condo de luxe est l'un des 14 dans le développement, mais il offre une intimité totale, la relaxation et le confort, si vous êtes une grande famille ou un couple sur une escapade romantique. Contactez-nous dès aujourd'hui pour réserver vos dates! We stayed a week at Oscar’s lovely condo with our 5-year old son, and it was perfect. The location is a short walk to the beautiful Playa La Ropa, and while the walk back up is a bit sweaty and dusty, you can jump in the pool as you pass by! We really appreciated Silvia’s visits to clean and the wonderful dinner she made us. The Punta Marina staff and neighbors were friendly and welcoming. We had a great time and we would love to return! I recently stayed at this property with a friend and my two children (aged 5 and 7). It was absolutely ideal for us. The condo itself is incredibly spacious and well laid out with a lovely ocean breeze at night - we only used the AC once! Silvia cleans daily and replenishes towels, etc. which is a real luxury. Oscar quickly responded to every question and query and arranged for transportation for the airport. Although this isn't necessary and costs a little more than a taxi, I loved the convenience and safety for my kids as most cabs seem to lack seatbelts. There is a very quick and safe walk down to the beach from the condo and the water temperature was perfect. My kids had a ton of fun playing in the waves (which were very manageable in size). The condo pool was pretty much ours for the entire 9 days and the kids also had a ton of fun playing in this - the water is a little cooler and quite refreshing. From the base of the hill you can also catch a cab or a bus into Zihua. We loved the bus and it is super cheap and seems to leave every few minutes so we didn't ever have to wait. Zihua is fun to explore and we took in a cultural festival which happens every Sunday evening in town - entertainment, street food, ++! We thought the margaritas at Rossy's (right at the base of the hill) were the best on the beach :). We enjoyed the smoothies at Pati's (at the other end of the beach) + next door to Pati's they offered pottery painting for kids and adults - you buy a piece of pottery (very inexpensive) and then paint it yourself and they fire it and give you the completed piece the following day. The kids had a blast with this. I'm not sure if this happens every day but we did it on a Friday. A perfect vacation at a perfect property with a perfect host. We will be back! Our family of 6 enjoyed Oscar’s condo for 3 weeks in January 2018. We had everything we needed to make our trip great! We also enjoyed our first nights meal immensely so perfectly prepared by Silvia!! We would highly recommend doing this!! As past reviews have stated, the climb back up to the condo from the beach is not for everyone so just be aware that it’s doable but steep! Overall we enjoyed our stay very much and would recommend it!! Thanks for your review Joy, im glad you liked our view, and Silvia Food, i agree its very good. Hope you come back. Perfect accommodations with a breathtaking view and spacious living! … Where to start? We have been to Zihuatanejo a few times and we were traveling with my parents who have been there every year for a couple of decades, but this was our first time in Punta Marina. We were six people ranging in age from 9 to 70’s and stayed over Christmas week. Although the pictures online are beautiful they absolutely do not do it justice...the views from the porch and front door are probably some of the nicest views i’ve ever had while traveling. I was also Surprised at the size of the bedrooms as well as the over all living area. We loved spending lazy afternoons reading on the porch after a morning of beach time. -The view!! I miss it as I type! -Having breakfasts and some lunches in our condo. We went on the first day and got groceries. - having our own bathrooms for each bedroom . There are probably many more things but these come to mind. -For my parents in their 70’s (but in very good shape) the afternoon hike up the steep hill back from the beach was a lot some days. The good news is it’s very easy to catch a taxi at La Ropa back to the condo. -If you plan an excursion or day trip and need to leave early- line up your transportation ahead of time. There are not as many taxis available in the morning and we had to walk down to La Ropa and a nice woman at the corner stand that sells drinks and snacks called a taxi for us. -There is a DVD player so if you want to bring movies along for the evenings, there is a lot of space and also Netflix is available. Overall, this was a wonderful place to stay! I hope to be back at Punta Marina and of my dozens of Mexico trips, this was probably one of my absolute favorites. Highly recommend. Thanks for your kind review Anne, we where happy to had you and we hope you come back soon. Im very happy you liked our service, and enjoyed Silvias food. Fantastic view. Great apartment. Silvia is an amazing chef. Love Zihuatanejo. El departamento está padrisimo, es un lugar donde te puedes relajar porque no hay nada de ruido y donde te sientes seguro. La vista que tiene al mar, desde las terrazas es hermosa. La alberca esta muy grande y muy a gusto. Hay varios restaurantes cercanos y Playa La Ropa está muy cerca, es una playa super tranquila, casi no hay olas lo que la hace ideal para los niños. El lugar se presta para un viaje tanto en familia como con amigos. El departamento está muy limpio y todo el condominio también (incluida la alberca). Muchas gracias Cynthia, que buenoq ue te gustaron nuestras terrazas privadas.